Vegetarianism is a growing trend in Thailand, and these dishes reveal just how tasty vegetarian Thai food can be. Included are many Vegan dishes, as well as gluten-free meals. These recipes are brimming with Thai taste and are also nutritionally balanced. Enjoy a real vegetarian Thai meal at home tonight! In Thailand, pumpkin and coconut milk are commonly paired up to make a variety of soups, curries, and even sweet dishes. 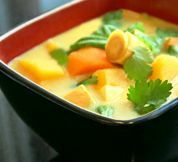 Here they are combined with a lightly curried soup that makes for a wonderful vegetarian/vegan entree - similar to those served at your favorite Thai or Vietnamese restaurant. Enjoy! This classic Thai pineapple fried rice recipe is real vegetarian Thai food! Thai jasmine rice is fried up with chunks of pineapple, plus cashews, peas, and currents with a curry-flavored sauce. This is one of my most popular recipes - give it a try! These spring rolls are brimming with vegetables and loads of flavor. And they're fun to make, too - get your kids or spouse involved in the rolling, and you'll be eating these crunchy spring rolls in no time. Makes a terrific party food! This scrumptious recipe for corn fritters is a real treat, and it's also vegetarian plus gluten free! - made with corn, tofu, and a variety of vegetables. The corn fritter batter takes only minutes to stir together, then just drop spoonfuls into hot oil and fry for a few minutes. An easy treat that is terrific as an appetizer, snack, or finger food for a party. Eggplant is delicious on the grill, and this recipe makes it even better with the use of a Thai-inspired marinade. You'll enjoy its sweet-spicy flavor - makes a superb side dish to any meal you might be cooking (Vegetarian and vegans: see tips below recipe for how to make this dish into a complete meal). Happy grilling! Mushrooms and rice go together beautifully in this Thai recipe for fried rice. Includes other veggies too, like peas and yellow pepper, for a rice dish that sings with flavor, texture, and supreme freshness. It all comes together quickly in the pan and this recipe is a cinch to make too! An authentic Pad Thai recipe for real vegetarian/vegan Thai food lovers. This Pad Thai recipe offers adequate protein in the form of tofu or eggs, and ground nuts. Plus, because it's made with rice noodles, Pad Thai is a naturally gluten-free recipe. Give it a try! This vegetarian curry offers the bright colors of autumn - orange, yellow, and red - infused with citrus accents. You'll love the delicious taste of this curry, as well as its healthy combination of vegetables. Makes a beautiful main course dish for a vegetarian/vegan dinner-party or Thanksgiving dinner. This simple recipe offers restaurant-quality Thai noodle soup in just a few steps! It's a great natural remedy if you're fighting a cold or flu bug, and will boost your mood too. It's the lemongrass that does it - this added to a variety of healthy greens and a mound of thin gluten-free rice noodles. Enjoy! An authentic Thai Green Curry Recipe for the vegetarian palate. This recipe is vegan, and you can also choose to make it gluten-free. Any way you cook it, this is such a tasty meal, you'll tend to forget how healthy it also is! This Pumpkin & Sweet Potato Curry is beautiful to serve and so delicious. Makes for a flavorful side dish, but is also a meal unto itself. Chickpeas can be added as a additional protein source, making this a perfect main course for vegetarians/vegans (it was tested both with and without the chickpeas - delicious both ways!). The curry sauce is easily made from scratch, so it's both fresh-tasting and very healthy. Give it a try! This Vegetarian Thai Yellow Curry is delicious and hearty! Note that here I have dispensed with making a curry paste; instead, all the minced herbs and dry spices are added directly to the curry pot - a great time-saver if you're in a hurry! And unlike a lot of other yellow curry recipes out there, I don't use curry powder, preferring to add the individual spices for a superior-tasting curry. This vegetarian/vegan stir-fry sings with so much flavor, you'll forget all about its amazing health benefits. The tofu is really delicious, but also optional - if you just want vegetables, you'll still get a great stir-fry out of this recipe. Hope you enjoy it as much as my family does! Thai Peanut Noodles are made with real peanuts instead of peanut butter - and you'll taste the difference! This vegan dish offers a feast of flavors: nutty, spicy, sweet and sour combined with the chewy-sticky texture of stir-fried rice noodles. Add tofu, or make them just with the peanut sauce. The key to this dish is not to over-soften the noodles at the beginning - they need to remain firm in order to be stir-fried later without falling apart. ENJOY! Tom Yum Thai Spicy Soup Recipe with a vegetarian twist. It's an easy soup to make, and just as delicious as the original recipe. Make this soup as an appetizer for an Asian-themed dinner party, or as a nutritionally complete meal unto itself. In Thailand it is often served with rice on the side. ENJOY! This salad will blow you away with its tastebud-awakening flavors and mix of textures. And as a bonus, it's low in calories and fat. Enjoy it as is, or make it into a complete meal by adding some fried tofu. Any way you toss it, this healthy salad will be sure to win rave reviews from all your culinary fans! A lot of vegetarian curries tend to be rather bland and tasteless, but not this one! Made with tofu and lots of fresh vegetables, this dish is vegetarian, vegan, and gluten-free. Makes a great everyday meal, but also pretty and tasty enough to serve at a dinner party. These stir-fried noodles are made with a flavorful stir-fry sauce composed of lime juice, soy sauce, white pepper, and chili. Note that although most Thai noodle dishes are made with rice noodles, there are also various Chinese-inspired Thai noodle dishes made with wheat or egg noodles, as in this recipe. I always love all the noodle dishes available in Thailand, simply because they are never bland or lacking in flavor. I'm sure you'll find this the case here. ENJOY! Try this Thai Tofu Satay for a vegetarian/vegan main course dish that's incredibly flavorful and nutritionally complete. The satay marinade for this dish has been handed down through my husband's family for generations, going all the way back to Thailand and northern Malaysia, and you'll taste its authenticity! Be sure to pair it with my Real Peanut Satay Sauce - it's easy to make and adds the finishing touch to this great vegan dish. This is an authentic vegetarian Thai Green Curry recipe that's simple to make from scratch (no packaged curry paste required). This Green Curry tastes like a green curry should - very fresh and zinging with taste! Includes tofu or chickpeas (your choice) for protein, plus lots of healthy vegetables for an excellent vegetarian or vegan curry you'll want to serve both family and friends. Easy Thai Cucumber Salad - New! For a delicious vegetarian Thai salad, try my easy Thai Cucumber Salad. This salad achieves all of the flavor and taste of non-vegetarian Cucumber Salad without resorting to using fish sauce or shrimp paste, plus it's virtually fat free! This green papaya salad, known as som tam, is popular in most areas of Thailand, and when you taste it, you'll know why. Green papaya salad is a beautifully unique and flavor-filled dish that will make a great impression. It's also easy to make, low-calorie, and very nutritious. Lettuce wraps are also a fun dish to eat, either as an appetizer or as a main course dish. Serve the filling on a platter with whole lettuce leaves on the side, and let your friends and family wrap their own. They'll love the combination of crisp, cold lettuce with the warm, flavorful filling. For a vegetarian dim sum treat, try these delicious Thai Steamed Dumplings made with a shiitake mushroom-tofu-ginger & coriander filling. These dumplings are steamed, but with an option to fry them to create pot-stickers (goyzas). Learn how to make your own homemade deep-fried tofu (gluten-free!). This recipe is fun to make and delicious to eat. Serve on its own with sweet chili sauce, or use it to add to your other vegetarian Thai food dishes. This Thai fusion noodle recipe is extremely easy, plus healthy and wonderfully delicious! Rice noodles and fresh basil are the key ingredients. This noodle dish cooks up in no time, and is equally superb as a weekday dish or to serve company. This simple eggplant recipe is aromatic and flavorful, owing to the generous amount of fresh garlic (this also makes it extra healthy). This eggplant recipe works with any type of eggplant - whatever is fresh and available where you live. You can also adjust the spice level, taking it anywhere from mild to spicy hot, according to your liking. Coconut rice makes a great side dish to accomapany any of the above Thai curries or side dishes. It's simple to put together, and makes any meal extra special. ENJOY! This saffron rice may just be the easiest rice recipe you'll ever make. Just put together a few ingredients and let them simmer in your rice cooker while you get on with other things. Saffron rice makes a delicious accompaniment to all types of Southeast-Asian and East Indian dishes, but is equally beautiful to serve alongside nearly any Western dish you might be making. ENJOY! This easy dessert is so exotic and scrumptious tasting, you'll want to make it the next time you're entertaining guests. Although most tapioca puddings take hours to make, this one is ready in 30 minutes or less (I made mine in 15). The fresh mango is optional - you'll find this tapioca pudding equally delicious without it too. ENJOY! This recipe for glutinous rice cake(s) (also known as Sweet or Sticky Rice Cake) is actually really simple to make, and is even easier you can leave off the Asian-style 'icing', although that's yummy too. Sticky rice is a true Asian culinary experience, one that shouldn't be missed, and so satisfying in its chewy-yummy texture. Healthier than most Western desserts too. Enjoy! Unlike most fried banana recipes, this one doesn't involve a messy batter. It's surprisingly easy to make, and tastes like restaurant-quality fried bananas. Enjoy them hot from the pan, or add ice cream on the side (vanilla or coconut) for a special Thai dessert that is to-die-for delicious! Try this fantastically easy recipe for Mango Sorbet! Quick and simple to make, and there's no stove involved. You'll need only a blender or food processor. This sorbet is creamier than most, halfway between sorbet and ice cream, but still light and full of mango flavor. This Mango Sticky Rice Dessert (Khao Niaow Ma Muang) is a classic Thai dessert and SO very scrumptious. The sticky rice can either be steamed, as they do in Thailand (a colander can be used for this), or you can make it in a pot on your stove (instructions included). You'll love this classic Thai dessert! This is a pretty gluten-free cake made with sticky rice and rice flour. Makes an exotic treat - great for serving at Christmas due to its bright green coloring (from the pandan paste). ENJOY! I'm particularly proud of this cake, since it has literally taken me years to get it right! It's made of sticky rice and tapioca flours, and is both gluten and lactose free (it's also vegan). A truly asian dessert, this type of sticky rice cake can be found in many southeast-asian countries, with slight variations according to the region and the chef. Takes a little time to make, but the results are worth it. This recipe for homemade coconut ice cream is similar to the ones they sell on the street in Thailand. Deliciously "coconutty", you'll be surprised it can be made without a machine. Also healthier than most store-bought ice cream.